BAAC offers Membership/Event/Finance Database Manager for any Membership Organization. Associations, Clubs, Non Profits. In House MS Access Database that can be shared in a network environment with multipel users and link data to an existing website. User can integrate the data to a variety of website pages. 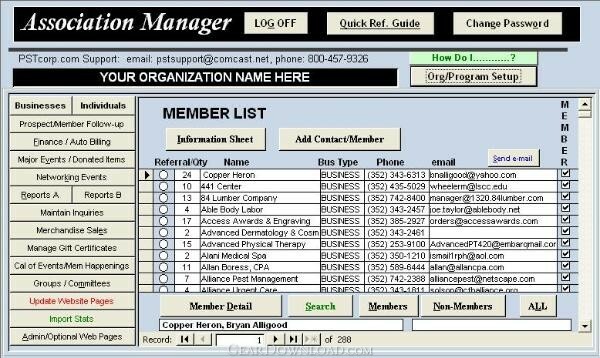 Pages can be Member Directories, 10 unique Specialty Directories, Calendar, Member to Member specialsEmployment, Members with Coupons, or Newest Members. This helps your visitors find what they are looking for faster and with less clicks. Users also have the ability to add pictures to member listings which can generate substantial non dues revenue. BAAC, Inc. makes there revenue by supporting our clients with low cost annual support or clients may opt to purchase our services as needed. There are various levels of annual support as well as individual pricing such as network setup assistance to use the program on a network with multiple users sharing one data file. This download (AssocMgrInstall.exe) was tested thoroughly and was found 100% clean. Click "Report Spyware" link on the top if you found this software contains any form of malware, including but not limited to: spyware, viruses, trojans and backdoors.